I just signed in to my blog and realized I have logged over 100 posts so far!! Whew – I can’t believe it! Hopefully someone is out there reading all of this….. hee-hee. Just thought I would share a picture from our SNOW DAY here in Atlanta yesterday. There was enough snow to build a snowman – and he is STILL standing today! My husband is from Buffalo, so he’s a pretty good snowman builder (if there is such a thing). We had fun playing outside, although, poor Kylie was probably freezing in her sneakers and knit mittens – we don’t really have any snow attire for her. And this is definitely one of those moments you just hope you can catch with the camera. 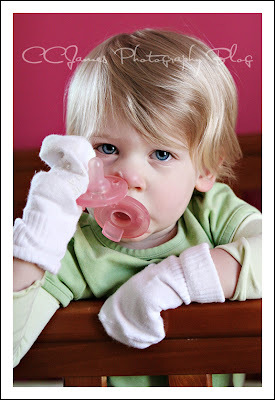 We came upstairs to get her from her nap and she had taken off her socks and put them on her hands as mittens. They do kinda look like her mittens – so maybe her hands were cold. 🙂 And yes, we still let her have her passy’s for sleeping – but only in the crib. We haven’t been brave enough to take them away yet…… uggghhh. I think we are more attached to them than she is.